RICHMOND is expecting its worst fears to be realised, with star defender Alex Rance suffering what the club believes is a “suspected ACL” injury on Thursday night. The five-time All Australian left the field late in the third quarter of the team’s 33-point win over Carlton after landing awkwardly on his right leg in a marking contest. 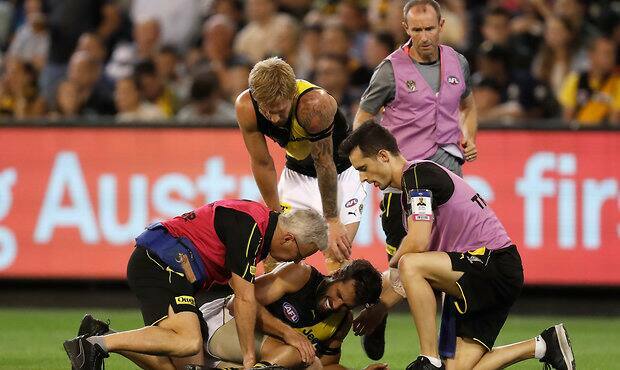 Rance’s knee looked to buckle upon landing, with the Richmond premiership player immediately taken from the field in pain by the club’s doctors. Speaking after the game, Richmond coach Damien Hardwick said the early prognosis was grim for the club’s mainstay down back. “It’s probably a suspected ACL at this point,” Hardwick said. “It’s incredibly disappointing, but measure of the man – you wouldn’t know it by his demeanour. He’s such an incredible person first and foremost. “It’s going to be disappointing if it is (an ACL). He’s an incredible player and you hate to see those players go out of the game. Playing in his 200th game, Rance went straight to the dressing rooms after hurting his knee, but returned to the bench to see out the match with ice heavily strapped to the injury. However, despite the club holding grave concerns about the scans he will undertake in the coming days, the Tigers do not believe it will ruin their premiership hopes. “Of course, it’s a challenge,” Hardwick said. “He’s obviously a champion of the game and he’s one of the best full-backs I’ve ever seen … but these things can be overcome. “It’s disappointing to lose such a fantastic player, but it also provides an opportunity for someone else to get some games under their belt. We’ll get to find a player.